Prominent audiences present. Here: Daum and Saftig. 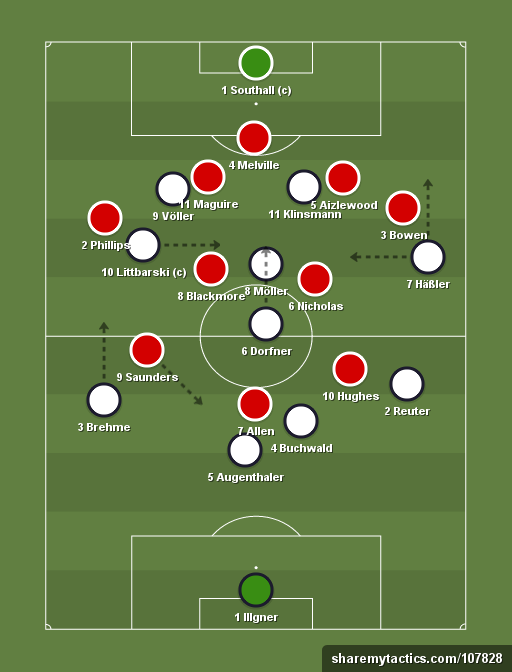 Beckenbauer had enjoyed success last time around with his 4-1-3-2 formation against Finland (h), and he kept with this formula for this all-important decider. It was a line-up designed to attack, revealing Beckenbauer's intention here. There was one important change to the midfield quartet, however, as Lothar Matthäus had sustained an injury for Internazionale against Lazio and had been ruled out of play for the upcoming weeks. His replacement was Hans Dorfner. Matthäus does of course have a key role in this team as a holding midfielder behind three attacking-minded players, but Dorfner had made a good stand-in performance previously that autumn against the Republic of Ireland, and was given the nod again here. This was, in fact, the only change Beckenbauer did make to the team that beat Finland 6-1 in October. There might have been discussion, however, whether he should have opted for Uwe Bein instead of Häßler after the sub-standard performance delivered by the latter against Finland. Bein had replaced him at half-time and been a big part of the team's great second half performance. However, that half of football was precisely sub-standard by Häßler, and most people would expect Häßler to deliver by his well-known standard again – this time even at home in Cologne. Völler had suffered a minor knock (knee) during a training session for AS Roma, and there was some doubt about his participation, but he recovered well in the days leading up to the match day. Beckenbauer admitted to West German media that he was unsure about how he would organize his defence: A back four or two man-markers in front of the libero? (Kicker 92, 1989). It would seem that his starting line-up here in Cologne was an example of the former. Regarding the selection, he did moreover claim that Guido Buchwald remained his first choice Manndecker, a claim supported by the fact that the Stuttgart defender now had played every international since the European Championships. The original squad had counted as many as 21 players, before being trimmed to 16 on the match day. The five axed players were: Jürgen Kohler, Hansi Pflügler (both Bayern München), Holger Fach (Bayer Uerdingen), Günter Hermann (Werder Bremen) and Frank Mill (Dortmund). Interesting to note that Kohler at this point had fell somewhat down in the pecking order, but probably much due to the injury that had put him out of action for some time, and he was still trying to recover his best shape. Press photographers enjoying some tobacco. 3-4-3 had by now become Yorath's default formation, and there was no surprise to see him maintain that formation also here in Cologne. The last game against Netherlands (h) saw a depleted Wales line-up, but Yorath could now welcome back star striker Mark Hughes, who referred young Iwan Robert to the substitutes bench. 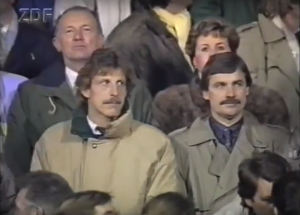 Ian Rush had been suspended in the previous game, and was reported to be able to play again, but due to a minor injury worry (tendon) it was decided that he would miss this encounter in Cologne. In his place, Malcolm Allen, who showed some promise against the Netherlands, would continue. Yorath also welcomed back Barry Horne, but since he only appeared as a mere substitute, it is tempting to believe that he wasn't fully match fit. His command of the midfield area was missed against the Netherlands. They were boosted in that area by Nicholas being moved forward from the sweeper position, and the back three would this time be the experienced Mark Aizlewood together with young Andy Melville and Gavin Maguire. Kevin Ratcliffe was still missing here (groin). Another internal change was the swap between Blackmore and Phillips, the former now playing in midfield and the latter as right wing-back. On the substitutes bench, it was a first encounter in these qualifiers with Andy Dibble, who last Saturday had conceded six goals for Manchester City against a Derby County side that included Saunders and Williams. None other than Boris Becker himself. Beckenbauer had fielded a very attacking-looking 4-1-3-2 designed to open up a deep-lying opponent. The trio of attacking midfielders in Häßler, Möller and Littbarski hardly has its match in international football and would be expected to carve out opportunities against any opponent. Yorath’s game plan going into this match was as old as it probably was spot on: Get men goalside when not in possession and hoist the ball forward as soon as they got hold of the ball. With all four Welsh midfielders having a defensive nature, they would be hoping to cancel out the creative well of the West Germans and rely on their front trio to catch the opponents on the break. It’s no exaggeration to say that Wales hardly had seen the ball at all when they all of a sudden found themselves in the lead in the 11th minute after a quick and brutal counter-attack. Reuter had been harried back into his own half and eventually caught in possession by Mark Hughes. With an attacking-minded West Germany exposed at the back, Hughes released Allen who had set pace from the deep and the Norwich striker expertly knocked the ball past Augenthaler attempting a last-ditch tackle. One-on-one with Illgner, Allen lifted the ball above the goalkeeper. In a similar situation against van Breukelen in the previous match, Allen had looked hesitant, but here he showed good composure. 1-0 to Wales. The attack must have contained everything Yorath wanted to see. Hughes had come victorious from his tussle with Reuter, and Allen (accompanied by Saunders to his right) burst forward to catch West Germany on the break. Allen had already against the Dutch shown himself as a quick and opportunistic forward, ready to sniff out mistakes in the opponents’ defensive line, and here he took his goal well. The goal had little if any impact on the match scenario, however, as West Germany would maintain their siege and the Welsh continue to get men goalside. Beckenbauer appears to have made one adjustment after the goal, however, as Reuter, who had been seen in the right back position for the first 10 minutes (and made the mistake leading to the goal), would take up the position as central defender for the rest of the match. Reuter would an eye on Allen for the rest of the match, with Buchwald man-marking Hughes, as he had done in Cardiff. This was still a back four, but one consisting of three central defenders and one left back. Before the game, Beckenbauer had been quoted as saying that he was unsure whether to play with four or five men at the back. With Reuter moved into the centre, we suddenly had a pecular combination of the two systems. 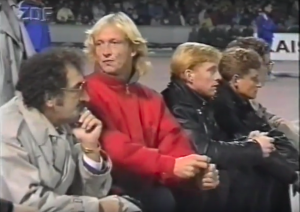 In theory, this would push Brehme a bit forward, but the Inter full back still had to keep an eye on Saunders, who threatened down the Welsh right hand side. It probably wasn’t an attacking change anyway by Beckenbauer, but a counter-measure against the Welsh forward trio, and it did after all mean that Reuter would end up giving less support to Häßler than what the early exchanges indicated. While Beckenbauer perhaps had second thoughts about how to defend against Wales, their attacking line-up was a joy to watch. Both before and after Allen’s goal, the Germans seemed to be creating chances at will. There was cohesion, there was fluidity, there was width, there was tempo on the ball – everything needed to carve open an ultra-defensive opponent. Much focus had been on the three attacking midfielders before the game, but what stood out for West Germany, was really their movement as a team unit. They managed to stretch a very deep Welsh side, and especially Völler and Klinsmann were often seen drifting wide to receive the ball, either holding it up or challenging along the ground. Frequent diagonal crosses enabled them to switch play quickly, and Brehme was brilliant as always going forward offering width and his superb crosses. Add to this an overall outstanding quality in the passes, Wales were struggling severely to close down the hosts. Wales were not defending particularly narrow, but were perhaps fairly happy about giving away space in the wide areas, gambling on clearing any ball whipped into the penalty area. If this was Yorath’s prediction, it proved to be not very successful. Despite often having a clear surplus of players inside the box, Wales were struggling to cope with crosses. Both Klinsmann and Völler were more than a match to their man-markers in the aerial tussles, showing their good instincts in positioning themselves for the crosses that were swung in, and managed to connect with a number of crosses from the wide areas. It has to be questioned how well the defensive positioning of Wales was working in this 3-4-3 formation. It seemed at least to be badly exposed by this West German side. Völler's acrobatic manoeuvre, giving 1-1. With the hosts piling on the pressure, the equalizer seeemed inevitable. On 25 minutes played, Augenthaler towered above Melville on a corner, knocking the ball down for it to be squeezed past Southall by a very alert Rudi Völler, who had anticipated the direction of his libero’s header. To Yorath’s big disappointment, this was yet another goal conceded on a set-piece situation in these qualifiers. The inability to defend crosses swung in from corners and free kicks had really been the undoing of the Welsh in the campaign for Italia’90, having conceded goals this way on two occasions against the Netherlands and once against Finland already (vital goals as well, being the first goal they conceded in each of these games). One could perhaps also add Bosman’s headed goal in Wrexham, where they yet again had lost their men inside the penalty area, and even Ukkonen's direct free-kick in Swansea. Here in Cologne, Melville couldn’t really challenge Augenthaler in the air, and Hughes lost control of Völler. Peter Nicholas voiced his displeasure with yet another goal conceded from set pieces, and it had really been a thread in Wales’ qualification so far. A goal against was probably in the cards anyway in this match, and crosses had already proved troublesome to defend against. The goal itself was really well taken by Völler, who had been looking fired-up from the very beginning of this match and with a big presence inside the penalty area, seemingly always a step in front of his man-markers inside the penalty area, and using his accelaration to challenge when receiving the ball in wide areas. No surprise to see him as a goal scorer here, for what was his fourth goal of the 1990 qualifiers. He was perhaps in the shadow of the three attacking midfielders, but one of the most interesting players in Beckenbauer’s team this evening was Hansi Dorfner, Matthäus’ replacement. Although categorized as a holding player, he was eager to join the three creative midfielders, adding to the fluidity of the team. From his deep position, he would contribute with incisive passes that opened up the opposition, or he would join attack with a surging run. He did expertly to inject some pace when an attacking move looked to have stalled with some clever runs from the deep. You already had Möller playing at the top of the midfield, contributing much on his own with his vision and guile, even bursts of pace, but with Dorfner in addition shuttling forward now and then, West Germany gained real momentum. His interpretation of the role was focused on attacking contributions (as with rest of the team), and it must remain an open question whether he should have stayed more behind to assist the defenders, who were standing a risk against the three Welsh forwards. Klaus Augenthaler was another good player on the night, having recently returned in favor in Beckenbauer’s view. He has sometimes been criticized for being too little adventurous for the libero role in the West German national side, and it is true that he didn’t make too many probing runs forward with the ball at feet. But against Wales he did show his passing skills, proving the ability to open up play and stretch defences by sweeping diagonal passes. Matthäus is of course normally the main supplier in this respect, but in his absence, this task was taken well care of by Dorfner and Augenthaler. Augenthaler looked very assured and determined in his libero role, and the quality of his passing ought to have silenced his critics somewhat. Beckenbauer’s team has a great engine, but not even they could sustain pressure for the entire 45 minutes of play. And as the Germans lost some of their momentum after the equalizer, Wales were invited back into the game, still on the score 1-1. Once in possession, Wales chose route one going forward. They knew that the Germans were eager to press high up the pitch, and the three defenders would sometimes knock the ball between them a few times so as to invite their opponents onto them, before hoisting it forward. It didn’t really matter which of the three strikers they were targeting. Hughes is by far the natural target with his physical presence, but they were perfectly happy to launch it forward for Saunders to battle it out with Augenthaler, for example, in the hope of someone in a red jersey picking up the knock-downs. The long balls mostly resulted in aerial tussles, as there wasn’t too much space behind the West German defence for Saunders and Allen to run onto. The three Welsh forwards were largely responsible for the attacking movement themselves. The four Welsh midfielders made a minimum of attacking contributions. Nicholas and Blackmore were obliged to give some support to their front trio, but both wing backs were reluctant about crossing the half-way line. Blackmore didn’t quite look at home as a defensive midfielder (against this opponent, anyway), usually seen running inbetween, while Nicholas seemed to have more of a positional sense, and did his usual to stamp some authority on the game. Remarkably, the half ended with Wales creating a few more than decent opportunities to take the lead again. Saunders and Allen were presented with big chances from corners, while Mark Hughes finished a longer attacking move with a strong header. It could in fact easily have been 1-2 going into the break. Half-time standings: West Germany out of Italia’90! It's probably one of the least known stories of Italia'90, but West Germany were by half-time in the last qualifier out of the tournament. They had the same goal difference as Denmark (+9), but were ranked behind because of less goals scored (15 compared to 12). Thus, there would be no appearance for the Germans in Italia'90 based on the standings at half-time. Augenthaler had picked up an injury toward the end of the first half, as Clayton Blackmore launched a wild tackle at his shin. The tackle warranted a booking from Mr. Vautrot (and one might perhaps have seen a red card by today’s standards). The libero had ended the half with a limp, and it came as no surprise to see him replaced at half-time by Alois Reinhardt. Reinhardt is more known as a man-marker, and his only appearance so far in the qualifiers had been in this role (which happened to be aganist Wales, in Cardiff). Here, he slotted into the position of Augenthaler, taking out depth behind the two man-markers Buchwald and Reuter. The question at the start of the second half was whether the Germans could reproduce the brilliant performance from the first 30 minutes of the game. Only a bit more than two minutes into the second half, Häßler scored the goal that put West Germany in front against Wales (and eventually sent Beckenbauer’s team to Italia’90). The goal revisited a pattern in the game. Taking on Phillips, who was left alone without cover on his right wing-back, Littbarski easily skinned the Norwich utility man to put yet another cross into the box. The ball skimmed off the top of Melville’s head, just for it to land at the feet of Häßler at the far post, who put it past Southall to give West Germany the lead 2-1. With the match being played in Cologne, it was perhaps only fitting that the goal was produced by two players from 1. FC Köln. Perhaps unfortunate with Melville’s touch (it would otherwise have been cleared to a corner kick by Aizlewood), but Wales had looked vulnerable in the wide areas all evening, and they would have needed to have more cover so as to prevent the large amount of dangerous crosses they were exposing themselves to. Saunders and Hughes, the two “wide forwards” did have defensive responsibilities, but it didn’t always add up defensively, as in this situation. Leading 2-1, West Germany were in fact for a brief moment here leaders of group 4, as Netherlands still couldn’t find a goal against Finland (0-0 in Rotterdam). The current standing would send both West Germany and Netherlands through to Italia’90, with Denmark ending at the bottom of the combined runner-up table. With West Germany in the lead for the first time, the match opened up, as Wales had to push their team forward. But although spaces were opening up in midfield, the Germans were evidently trying to find a new balance. On the one hand side, they saw that they were superior in the attacking department, and that a third goal was within reach with all their prowess. On the other hand side, they had (despite two goals!) been inefficient in front of goal all evening and moreover seen the threat poised by Wales’ front trio. They would still control the game, but there was a question of how much they should risk going forward. News were soon also arriving from Rotterdam about a lead for the Netherlands, and therefore they would, as expected beforehand, need to secure the win without any help from Finland. When not in possession, West Germany now played with a more traditional-looking band of four midfield players, which significantly reduced spaces for the Welsh forwards. Möller sat in front of the defence together with Dorfner, and showed that he is capable of making good defensive contributions as well. He is of a larger frame than Littbarski and Häßler, and won a fair share of headers this evening. With also Häßler and Littbarski operating deeper without the ball, the working conditions for the by now famous Welsh forward trio became far worse. With the ball, Häßler and Littbarski had the freedom to exploit any spaces that opened up, and were seen roaming all over the pitch. The more open game especially brought forth the qualities of Häßler, who is a master of carrying the ball with speed over distances. He could be seen collecting the ball deep in the one moment, challenging the full back on the opposite flank in the next. But West Germany were increasingly focusing play through the congested middle, seemingly forgetting their exploits down the flanks, and also the two strikers were rarely seen drifting wide (Völler visilby hampered by a knock he received from Allen in the beginning of the half), as they had done with so much success in the first half. There was no particular response from Yorath to the new situation after going 2-1 down. A more cautious German side were taking increasingly fewer risks as the half wore on, and the struggle of the Welsh front trio looked much more difficult as the hosts made sure they always had enough cover, avoiding the risky 3 v 3 situations they would sometimes expose themselves to in the first half. Möller worked in tandem with Dorfner defensively, and Brehme kept himself closer to Saunders, who so far had escaped any marking. Yorath didn't really have any plan B here, once they let in that second goal. Wales’ strategy seemed to be one of patience, hoping that some nervousness eventually would trickle down the spine of the West German side, who knew that a conceded goal now would mean they were out of Italia’90. The rest of the game was mostly battled out in the midfield, with the occasional bursts forward from West Germany. Yorath did make a substition, as he replaced Bowen with Barry Horne. Bowen didn’t enjoy a particularly good game, and perhaps he didn’t feel quite at home as a wing-back – a position with which he was unfamiliar from his club side Norwich City. With Horne entering the field, Blackmore (another player who had looked somewhat out of sorts this evening) was moved down to the wing-back slot left by Bowen. This was not a tactical substitution, but one with the aim to inject some new spirit into the Welsh team, and there’s no question that a fit Barry Horne always will lift the side. The midfield pairing of Nicholas and Horne immediately looked more solid, contributing to a midfield battle where they were gaining some more yards at this stage of the game. It would be wrong to say that nerves got the better of the West German players, but it is nonetheless true that the match ended on a nervous note, as it more and more became evident that a third goal wasn’t about to come any time soon. The Germans had grown increasingly cautious, more intent on denying Wales any chances. The air of disquiet couldn’t even be soothed when Vautrot awarded West Germany a penalty kick for a blatant foul on Völler by Maguire inside the penalty area. It was a stone wall penalty, and the reaction of the Welsh defenders was nothing more than an acknowledgement of the obvious. Littbarski couldn’t convert the penalty kick, however, as the superb Southall saved the shot, punching the ball off the inside of the post and out . . . The final minutes of the match were hardly the most impressive by the home side, as they visibly did their best to retain status quo by transitioning to a defensive strategy. It did appear a hasty transition, and we would sometimes see some awkward positioning as the more attacking players tried to interpret their new roles. They had delivered one of the best attacking performances of the qualification with that first half, and now they had to defend the slender one goal advantage they had amassed. Intriguingly, Wales appeared to improve toward the end, as they sensed blood. It was as if they realized that their opponents had become awkwardly defensive and that it wasn't too late to get something from this (perhaps even experience some Schadenfreude?). Shortly before the final whistle, Mark Aizlewood was presented with a decent opportunity, as he had shuttled forward and outjumped Reinhardt to connect with substitute Colin Pascoe’s cross from the byline. It was a purposeful run by the central defender and he got real force behind it, but his jumping angle wasn’t the best, and perhaps did Allen, who was lurking next in line, have a better position. He would have needed to head it into the far corner, but instead it sailed above the crossbar. A goal here, however, would have spelled the end for Beckenbauer and Italia’90. . . It wasn’t to be, however, and when Vautrot a few minutes later blew the final whistle, Müngersdorfer Stadion erupted into jubilation. West Germany qualified for Italia’90 with a narrow 2-1 win against Wales, as a mere goal against separated them from having to watch the 1990 World Cup as bystanders. Beckenbauer had here opted for an all-out attacking formation, willing to take much risk against a defensive opponent. Some of the play presented in the first half ranks among the most exciting performances of the 1990 World Cup qualification, as West Germany stretched and punctured Wales. Plenty of fluidness and creativity in the midfield department ensured that chances always would be produced. It proved a success, although they couldn't alway contain their opponents as long as they threw everything forward, and Beckenbauer's early defensive change was a testimony of his uncertainty. The Welsh disappointingly finished group 4 without recording a single win, but could take pride from their two encounters with West Germany (the eventual World Cup winners!). Yorath’s 3-4-3 formation had its benefits as a counter-attacking strategy, but looked vulnerable all evening defensively, especially in the wide areas. They probably didn't have any convincing plan B either, once they were losing. We’re glad you like the website, Matias. Thank you for your comment.